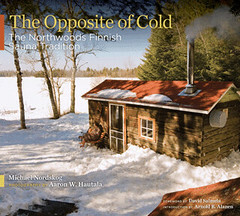 A new book from the University of Minnesota Press, The Opposite of Cold: The Northwoods Finnish Sauna Tradition, is a full-color history and celebration of Finnish saunas in the western Great Lakes. Michael Nordskog and Aaron Hautala, author and photographer of The Opposite of Cold, will present a slide show about the book at the American Swedish Institute tomorrow, September 30, at 7:00 p.m. Architect David Salmela, who wrote the book’s foreword,will be giving the introduction at this event. While you’re there, check out the exhibit My Paradise: Finnish and Finnish-American Summer Architecture, at the ASI until October 10. For more details, click through to The Opposite of Cold book trailers. Ojibwe in Minnesota by Anton Treuer was named “Best Read in Minnesota 2010″ by the Center for the Book in the Library of Congress. The book was featured at the National Book Festival in Washington, DC, on Saturday, September 25. Treuer is also the author of The Assassination of Hole in the Day, which will be available beginning in October. Each year at the festival, the Center for the Book, in cooperation with state affiliates, salutes the literary traditions of the fifty states, the District of Columbia, and the U.S. territories. The Minnesota Center for the Book at the Minnesota Humanities Center selected Ojibwe in Minnesota and Night Driving by John Coy for this year’s list. Ojibwe in Minnesota was featured in a “Discover Great Places Through Reading” brochure available at the festival, and the 52 Great Reads are listed on the festival website. While most historians concentrate on relationships with whites to explain Ojibwe history, Treuer in both Ojibwe in Minnesota and The Assassination of Hole in the Day tells that history from a tribal point of view—focusing on Ojibwe interactions with other groups, the role of Ojibwe culture and tradition, and interviews with tribal elders. 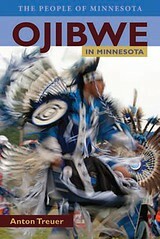 Ojibwe in Minnesota also does not shy away from today’s controversial topics, covering them frankly and with sensitivity—issues of sovereignty as they influence the running of casinos and land management; the need for reform in modern tribal government; poverty, unemployment, and drug abuse; and constitutional and educational reform. He also tackles the complicated issue of identity and details recent efforts and successes in cultural preservation and language revitalization. Anton Treuer, professor of Ojibwe at Bemidji State University, is the author of Ojibwe in Minnesota, The Assassination of Hole in the Day and several books on the Ojibwe language. He is also the editor of Oshkaabewis Native Journal, the only academic journal of the Ojibwe language. 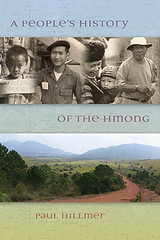 While Hillmer’s book is a look at the political and cultural history of the Hmong, for a literal taste of Hmong culture, head on over to Hmongtown in St. Paul. Located at Como Avenue and Marion Street, the indoor-outdoor venue features a farmers market, “food court,” Hmong arts and crafts, videos, health and beauty items, jewelry, clothing, and over two hundred vendors. Linda LeGarde Grover’s new book of short stories, The Dance Boots, is the winner of the prestigious Flannery O’Connor Award for short fiction, awarded by the University of Georgia Press in its annual competition. The stories focus on an important Minnesota story: the painful legacy of boarding schools in an Ojibwe family. The book’s official publication date is September 15, and its coming-out party is at 7 pm next Friday at Birchbark Books, 2115 West 21st Street, Minneapolis. “Labor Day, the first Monday in September, is a creation of the labor movement and is dedicated to the social and economic achievements of American workers ” (U.S. DOL website). The first Labor Day holiday was on September 5, 1882, in New York City, following the plans of the Central Labor Union. In 1884 the first Monday in September was selected as the holiday; the idea spread with the growth of labor organizations, and in 1885 Labor Day was celebrated throughout the country. The MHS Press/Borealis Books has a long tradition of honoring American workers, from millers to meatpackers, fishers to farmers. The following are some of our best offerings to help you understand the vital, daily labor that built our region and continues to keep us strong. 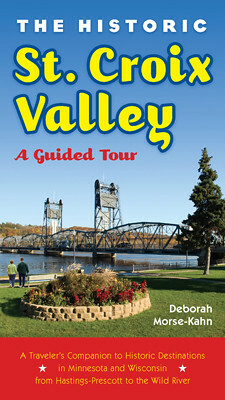 Deborah Morse-Kahn, author of The Historic St. Croix Valley: A Guide, recently sat down with us to answer some questions we had about her experience in writing her new book. How did this travel guide book come to be written? I had written a similar guide for MHS Press, Lake Superior’s Historic North Shore, two years ago. I had seen great change come to that beautiful area, and much of the change was causing the disappearance of buildings and sites that represented life on the North Shore of a century and more ago. I knew that each village along Superior had its own story, but few people seemed aware of those stories. I wanted to highlight the creation of Minnesota’s state parks, which dominate the North Shore and provide a favorite destination for travelers from around the world, with their spectacular geologic formations, waterfalls and heavy foresting. Like Lake Superior, the St. Croix Riverway has very rich history evident in wonderful architecture and dramatic archaeology, a great variety of landscape, a long timeline of settlement and the same richness of public land preservation.